AmPhi-VET-HPT is a balanced hepatic support formula that helps correct and reverse fat deposits in the liver. Free fatty acids are partly metabolized in the liver to form triglyceride, which may be stored in the hepatocytes, causing fatty liver when an imbalance exists among uptake, synthesis, export, and oxidation of fatty acids. AmPhi-VET-HPT includes Carnatine, Choline, Sorbitol, and vitamins, which are key components involved in these processes that help increase the influx of free fatty acids to the liver, free fatty acid oxidation, the hepatic secretion of triglyceride, and lipid peroxidation. Sorbitol acts as an osmotic laxative, aiding in the elimination of toxic products from the gastrointestinal tract. 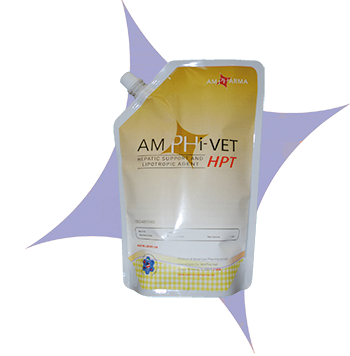 AmPhi-VET-HPT is a dietetic liquid supplement formulated to help in correcting fatty liver conditions and aid in preventing liver dysfunctions and digestive disturbances as a result of ingesting high oil and fat content feed. AmPhi-VET-HPT helps maintain growth, FCR, egg-production, hatchability, and viability of birds. AmPhi-VET-HPT aids in appetite stimulation as a hepato-renal tonic. Carnitine, Choline Chloride, Sorbitol, Niacin, Vitamin E, and Vitamin B12.